This week is Hedgehog Awareness Week and reading the various related tweets and blogs across the internet got me thinking about our own nocturnal visitors. We've been noticing an increasing quantity of Hedgehog droppings in the garden over the past month or so but thus far have had no sightings of the animals themselves. Not surprising perhaps given the almost total darkness we experience here at night so out went the Bushnell trail camera to act as our eyes and ears. 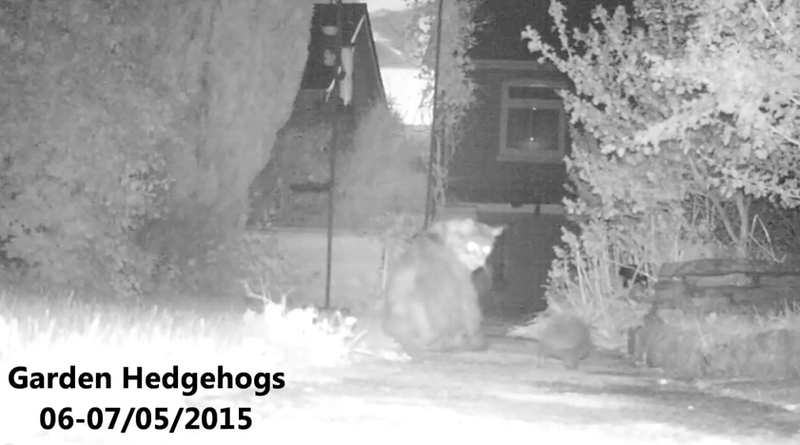 In truth I didn't expect to capture anything more than the local collection of feral cats so was over the moon to film the following footage during the first two nights. With the weather turning very nasty on Wednesday we kept the camera inside but it was back out on Thursday for what we hoped would be another eventful evening. Checking the recordings I don't think either of us expected to find what we did. 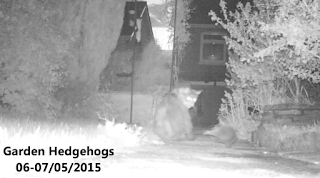 Not only was our Hedgehog back (puzzling a cat along the way) but it had also brought a friend. Judging from the size difference between the two individuals I presume we have both a male and female present meaning there's a great potential for breeding in the near future. We'll be doing all we can to encourage them to continue their visits with plans for a Hedgehog feeding station and shelter in the pipeline. Meanwhile the camera will continue its nightly vigil and hopefully we'll get some more great footage to share soon.